I can attest from experience that injecting humor into an otherwise serious tale of murderous intrigue isn’t easy. But Craig Johnson has been pulling off that enviable trick in his murder mysteries for well over a decade now, to national and international acclaim. I thoroughly enjoyed 2013’s As the Crow Flies, the first Longmire mystery I discovered. I’ve read and enjoyed all of Johnson’s books since. Johnson unspools not one but two absorbing mysteries in The Western Star, the recently released 13th installment in his Longmire series. Starring rural Absaroka County, Wyo., Sheriff Walt Longmire, the series serves as the basis for the hit Netflix TV show Longmire, now in its sixth season. Johnson lives and writes on a ranch east of the Absaroka Mountains near Ucross, Wyo., population 25. He’s headed to the Four Corners region in late January, when he will speak and sign books in Durango. Residents of the Four Corners area who appreciate the local, steam-powered Durango-Silverton Narrow Gauge Railroad will particularly enjoy The Western Star, which features as one of its parallel story lines a tale fashioned after Agatha Christie’s Murder on the Orient Express, set on an excursion steam-train ride across Wyoming. Johnson credits a number of steam railroad experts with helping him get his train facts straight in The Western Star. Having spent several summers employed as a machinist’s helper in the Durango-Silverton roundhouse, I can vouch for Johnson’s accuracy in his latest Longmire installment, which also captures the flavor and enduring appeal of steam railroading. 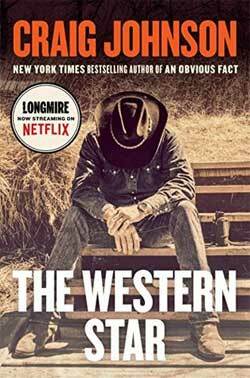 The Western Star bounces between Walt Longmire’s train journey across Wyoming in 1972 as a newly minted deputy sheriff riding herd on a bunch of irascible, hard-drinking Wyoming county sheriffs, and a dilemma facing present-day-sheriff Longmire: whether to stand in the way, for deeply personal reasons, of the compassionate release from prison of a dying murderer. While he unravels the train mystery, the 1972 version of Longmire wrestles with personal demons stemming from his service in the Vietnam War, making The Western Star darker than previous installments. No matter. The book’s two stories still combine to make for a fine read, straight through to the cliffhanger ending that sets the stage for an obvious sequel. Johnson, personable and quick-witted, is renowned for his personal appearances. His upcoming local speaking engagement, before what is sure to be a packed house, will be held at the Durango Public Library on Thursday, Jan. 25, at 6 p.m., compliments of Durango’s inimitable, independent Maria’s Bookshop. Scott Graham is the National Outdoor Book Award-winning author of the National Park Mystery Series for Torrey House Press. The fourth book in the series, Yosemite Fall, will be released in June 2018. Visit Graham at scottfranklingraham.com. From December 2017, Prose and Cons.